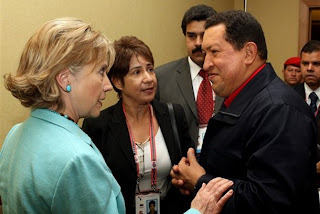 US Secretary of State Hillary Clinton and Venezuelan President Hugo Chávez in Trinidad and Tobago for the Summit of the Americas, April 2009. I would give anything to know what had been said just before this photo was snapped! Does anyone know? 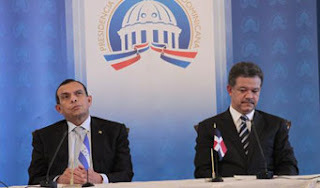 Honduran President elect Porfirio Lobo with Dominican Republic President Leonel Fernández upon the signing of the new "Accord" in the Dominican Republic. Honduras Weekly published an article, Mel the Grateful, about Manuel Zelaya's inability to show appreciation to Porfirio Lobo for his efforts on Zelaya's behalf. Zelaya did later rectify that to a very small extent, but insisting that his departure from Honduras disrupt Lobo's inauguration day celebrations shows that Mel still believes that the world should revolve around him. Lobo showed graciousness, and I would even say bravery, in accompanying Zelaya to the airport. Based on past experience with Zelaya and his followers, anything could have happened. On the other hand, Lobo also has shown a lack of gratefulness. One very important point is that Pepe Lobo should remember that he has Roberto Micheletti to thank for his election. While dozens of presidents and international organizations around the world were trying to stop the Honduran elections (at the same time they were lamenting the need for "the return to institutional democracy in Honduras"), it was Roberto Micheletti and only Roberto Micheletti who ensured that the elections would occur. As early as June 28, in his first speech, and in every one of the many speeches and press conferences after that, Micheletti told the Honduran people that free and democratic elections would occur on November 29, as scheduled, and that "no one, absolutely no one" would stop them. We never had any reason to doubt him and neither did any of the presidential candidates, who could have easily cried to the world if they thought otherwise. Even the two Resistance candidates who called Micheletti a dictator knew it wasn't true. A dictator wouldn't have held elections and certainly wouldn't have allowed them to speak their minds. President Roberto Micheletti never promoted the candidate of his own party (or any other party) and never denigrated any of the candidates in any way. He behaved with dignity and impartiality. 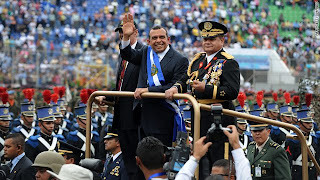 In his farewell speech, he called upon the Honduran people to give greater understanding and support to Porfirio Lobo, and made an appeal to the international community to do the same. Unfortunately, Pepe Lobo not only has not shown gratitude for that, but he's also smeared Micheletti by making vague comments about "both sides", throwing Zelaya (who did everything humanly possible to stop elections) and Micheletti into the same pot. Lobo publicly pushed for Micheletti's resignation. He announced that he didn't want Micheletti at the inauguration without showing the courtesy to discuss it with Micheletti first. 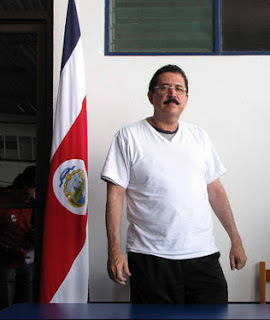 He worried about the dignity of ex-president Zelaya, who demonstrated no dignity, but not that of President Micheletti. There was much celebration and cheering yesterday, but during President Lobo's inauguration speech, when he thanked Costa Rica President Oscar Arias, the crowd booed. He thanked US Secretary of State Hillary Clinton − the crowd booed. He thanked US Ambassador Hugo Llorens − the crowd booed. He thanked OAS Secretary General José Insulza − the crowd booed. He thanked Dominican Republic President Leonel Fernández − the crowd booed to such an extent that Fernández looked quite uncomfortable. All had tried to force the resignation of Roberto Micheletti and the return Zelaya to power in Honduras. In contrast, when Lobo thanked Panamanian President Ricardo Martinelli, the crowd cheered to such an extent that Martinelli rose from his seat to acknowledge the crowd. The crowd then cried, "Say thanks to Micheletti! Thank Micheletti." Lobo did not, though a person sitting near to him said that he must have heard the pleas from the crowd. Just a small public thank you would have meant a lot. It's ironic (or hypocritical if you prefer) that so many outside of Honduras say that "even if Zelaya was a bad president, the ends don't justify the means", but those same people seemed to believe that any law could be broken to restore Zelaya to power. Foreign presidents and international organizations have been trying for seven months to force illegal, undemocratic, and unconstitutional actions on Honduras in the name of "restoring democracy". Unfortunately, this interference in Honduras' internal affairs is not going to end with Pepe Lobo's inauguration. Guatemalan President Colom's (photo) suggestion that Pepe allow Mel Zelaya to be president for a few minutes takes the prize as the most idiotic. It's frightening to think that people like this are running countries! Just how can a president-elect make someone President? After Pepe Lobo is inaugurated and actually has any legal powers, the only way Zelaya could be president, even if illegally and even if for a few minutes, is if Lobo steps aside. According to Honduras' constitution, anyone who has served as President (no matter how short the time) can never serve as president again, thus Lobo would be out and the new president of the congress would replace him, according to the order of succession set out in the constitution. Hah! 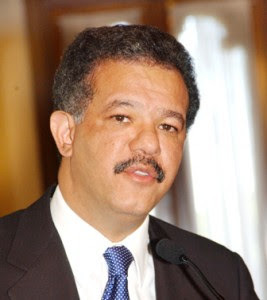 Dominican Republic President Leonel Fernández (photo), the US's front man for the latest "accord", hopes that Honduras will return to "civilized coexistence" with the international community. Hmmm, I know Honduras needs reconciliation but I did not realize that we had left civilization. I had a terrible fear that Fernández and Colom and/or the US State Department would try to force Lobo to allow Zelaya to attend the inauguration. I can't even imagine how the Honduran audience would have reacted to that. Zelaya will try to steal the limelight today and probably more international journalists are focused on him today than on Honduras' new president. Apparently he was denied the opportunity for grand farewell (I'll be back!) speech at the airport. 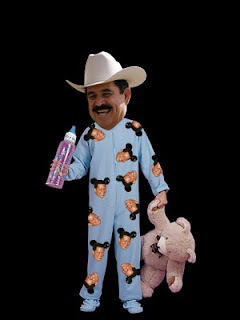 Depending upon his timing, Zelaya may be up against US President Obama's state of the union address. The score on that one will be Honduras - 0, US - 1. "But the key will be gaining Brazil’s support. That will require an amnesty for Mr Zelaya, a unity government including some of his supporters and a willingness to discuss constitutional reform, says a Brazilian diplomat." Hopefully the only change to the constitution that Brazil is pushing is the reincorporation of the impeachment clause, because any other suggestions are unwanted interference in the government of another country. 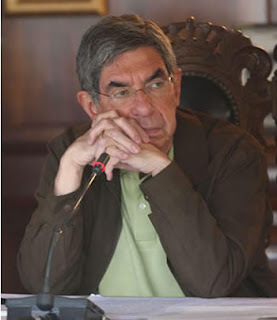 Costa Rica President Oscar Arias (photo) was just as bad and should be accused of promoting a coup in Honduras. Arias seems to think that a president-elect should have the power to force a sitting president out of power and replace him with a previous one. Arias publicly insulted Pepe Lobo, calling him too weak because he couldn't accomplish this, and saying that the Honduran people deserved better (forgetting that Honduras has had a strong president for seven months and Arias did not like that at all!). To ponder the idiocy, just think about this: It's December 2008. Picture president elect Obama trying to force out George Bush and replace him with Bill Clinton! Is that an idiotic thing for a president of another country to propose? I certainly hope that the next president of Costa Rica gives Honduras a well deserved apology for all of the tasteless remarks and insults from its former president. 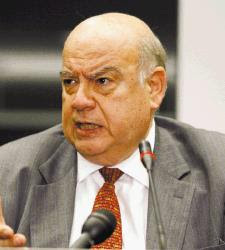 José Insulza of the OAS (photo) has issued several warning statements that Lobo should disassociate himself from the golpistas (coupsters). And this relates to peace and reconciliation in what way? Who are the golpistas? Micheletti? The cabinet members who agreed to upset their lives for 7 months serving their country in a difficult time? The military? The Supreme Court? The congress who voted 111-14 to not restore Zelaya to office (and of whom 54 have been reelected)? The churches? The civic groups? Insulza is promoting division in Honduras, not reconciliation, by suggesting that Lobo disassociate himself from 80% of the population. Reconciliation doesn't mean appeasing the resistance. Reconciliation involves inclusion of both sides. So what is the result all of this outside intervention in Honduras in the name of the Honduran people? Angry comments from Hondurans about amnesty and Lobo's deal to allow Zelaya to leave Honduras abound on newspaper articles, Facebook and Twitter. The email chain letters are afire again, this time with a tone of indignation. Some are even using the word "traitor". This "accord" was an unexpected shock to many. Lobo's remarks that he was elected by the people and will now make the decisions that he thinks best (regardless of the opinions of the people or other powers of state or the laws) are frighteningly reminiscent of Zelaya who acted as if he had been made king of Honduras. Those comments are also in direct opposition to what he told voters during the campaign. Pepe Lobo promised that his decisions would be based on national dialogues with the people after the election. 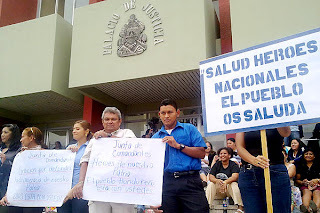 Honduran blogger Aaron of Pensieve is angered by the US's violation of Honduras' sovereignty. Forcing the Constitutional President of Honduras, Roberto Micheletti, to symbolically "retire" from the presidential palace in the days before the election is just another example of the US putting the boot to the neck of Honduras, just because they can. It serves no real purpose except to humiliate Honduras and show "who is boss". The resistance is now protesting dictator Lobo instead of dictator Micheletti. Honduran blogger Dennis of Universal Honduras expressed his displeasure in De Puño de Hierro a Blandengue (From Iron Fist to Softie). Daniel of Cascabel Team of Destruction voices his opinion in Una Discutible Decisión de Lobo (A controversial decision of Lobo). Ardegas at Born in Honduras gives his analysis at Pepe Lobo, new Honduran President. Marco Cáceres sees it a different way. The inauguration continued after posting this, and the people in the stadium loudly booed president Oscar Arias from Costa Rica, president Fernandez from Dominica, ambassador Llorens from USA, and OAS with Insulza… but applauded president Martinelli from Panama. There was a not so loud booing of the amnesty – but no applauds. Now he is signing it. Louder boos. Lobo the coward has still not in his speech acknowledged the work of Micheletti, even though without him, he would not be president now. If he doesn’t, he will do himself a tremendous disfavor, and ruin the political consensus that existed since June 28.
Who wrote this new accord? I had a hunch about this new agreement with DR president Leonel Fernández. I clicked Google's translate button and sure enough, the agreement translated almost perfectly to English - a sign that it may have been written in English and translated to Spanish for publication. Generally the Spanish sentence structure varies a lot causing translation problems with Google. Since both the DR and Honduras are Spanish speaking countries, what English-language country do you suppose might have written this document? Yesterday, Saturday, January 23rd, was Honduras' night against the United States at the Home Depot Center in Los Angeles! We won! 3 to 1 ... screamers! The game was more exciting but we were also excited to be in a stadium full of Honduran people! Lots of blue and white, many flags! It gave me pride to see that we are peaceful and how exciting to see Honduran football! Making waves with flags, shouting "Honduras", "Ole", and once in a while the traditional "Culero. We felt the happiness of the fans. We can understand Honduras president-elect Pepe Lobo's dilemma. Besides the political pressure, he's inheriting a bankrupt government. I've used the term "between a rock and a hard place" a couple of times. 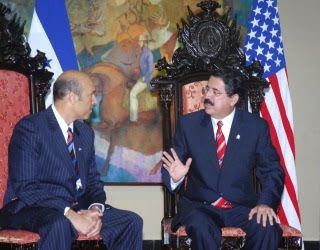 Manuel Zelaya stepped into a cushy financial position in 2006, at least cushy by Honduras' poor standards. Many hundreds of millions of US dollars of debt had been forgiven thanks to efforts by the previous president, Ricardo Maduro. New aid was flowing in. Eventually, aid began to be reduced because, for example, the UN and Sweden complained of poverty funds being used to meet government payroll and campaign promises rather than being used for the poor. Couple that with the effects of the international financial crisis and the resulting large reduction in family remesas, the economy is a mess. The internal debt is now at L. 23 billion (US $1.2 billion), more than tripled from 2006. The external debt of Honduras in 2008 reached the same levels as 2005, before the condonation. That is the state that Micheletti received. There had been no budget, no financial reports. They didn't know where the money had gone − except the L. 50 million in cash withdrawn from the national bank which was caught on video on June 26. The country again had huge debts, virtually no aid, and no access to BCIE or the IMF for loans and disbursements on government projects already approved and underway. Without the immediate restoration of aid and access to loans, there will be no money to meet payrolls, much less continue projects and meet Lobo's campaign promises. So, Porfirio Lobo will be in a bad spot when he takes over. He has been getting pressure from the US and OAS for months. Oscar Arias ominously threatened that Honduras could become the Albania of Latin America. On the one hand we have had President Roberto Micheletti who has strongly and consistently stood up with dignity against the intervention of the international community for seven long months. However, on the other hand, we have a president-elect who didn't make it even one day in office. That doesn't sit well with many, including many in Lobo's own party. Everyone seemed to be surprised by this new accord. There was apparently no discussion with civic groups prior to making this decision which implies that Pepe Lobo has placed more importance on pleasing the international community than pleasing the people of Honduras. Some analysts on television say that this shows disrespect for the court and attorney general, who have outstanding criminal charges against Zelaya and others. That is ironic, since disrespect for the other institutions of government was a big part of Zelaya's downfall. There also is the huge problem of the rule of law. There are pending court cases and accusations of crimes of corruption and financial malfeasance on the part of Zelaya and that undefined "intimate circle of friends" who will also be guaranteed safe passage out of Honduras. One of his inner circle, Rasel Tome (photo), has violated a court order and has been prohibited by the court from leaving the country. The Unión Cívica Democrática issued a strong pronouncement on that. The Honduran people have been victims of corruption and impunity for far too long. They thought they were going to see justice. 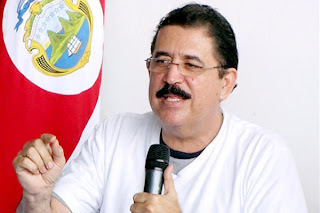 If Zelaya and his ministers who are guilty of financial crimes do not have to face justice, why should Pepe Lobo and his ministers or the next administration have any fear of justice either? 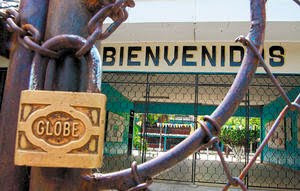 Will we go back to business as usual in Honduras, from the new "yes, we can" attitude back to the old, "what's the use?" attitude? Pepe Lobo (photo) talks and has always talked during the campaign of peace and reconciliation and dialogue. During the campaign, he was criticized for refusing to take a stand on several issues, saying only that he would dialogue with the people first. Apparently, he didn't. Now Pepe says, "They tell me that 85% are against amnesty and 15% in favor, but they elected me president to govern and not to be popular, they elected me to do what is correct for Honduras and I will do it to bring peace to the nation." Peace and reconciliation are badly needed, however, Pepe has been rebuffed by the resistance who refused to participate in the formation of the national plan and who have a big protest planned for inauguration day. He's been rebuffed by the teachers' unions who walked out of a meeting rather than agreeing to follow the law and who are currently planning their first teacher strike to coincide with the first day of the new school year, February 1. Lobo has also been rebuffed by Mel Zelaya, who refused to even recognize him as president elect, and only does so now because of personal benefit. There really is nothing Pepe Lobo can do that will appease either Zelaya or the resistance − nothing short of a constitutional assembly putting them in charge of the country. So while it's fine to talk of dignity, pragmatism, forgiveness, and so forth as being needed to reconcile the country, I just don't believe it will happen. That would be assuming that Zelaya is a reasonable person who would show some dignity and love for his country and react accordingly − working on his part for reconciliation of the people as hard as he worked to divide them. Zelaya instead has shown himself to be a person who is not reasonable and cannot be trusted. I hope that I'm wrong, but I don't think I will be. Regardless of the reasons for or acceptance or not of Lobo's decision to sign this agreement, I think that it will very likely be the worst decision that Pepe Lobo has ever made. While this new 'agreement' puts many requirements on Pepe Lobo, it puts none on Manuel Zelaya or the international community. I can't even fathom how Fernández in his wildest dreams can claim to represent the international community, unless, of course, we want to admit that the US gave him the go ahead. Even that US blessing on the Tegucigalpa Accord had no noticeable effect on the subsequent actions of the international community. Honduran analysts and attorneys have opined that there is no such thing as a "distinguished guest" category in international law. Some have said that Lobo has overstepped his bounds and even has broken the law, since in his current status as president-elect, he has no power to commit Honduras to anything. The Attorney General has indicated that this agreement has no effect on pending legal charges. After going to the Dominican Republic, I predict that Zelaya's first many hours will be spent giving flamboyant press conferences in which he will expound on the abuses of the 'dictatorship' and claiming a 'win' for his side. It is becoming abundantly clear that the Dominican Republic is only a stopping off place, so we may be seeing another world tour from Zelaya in which he tries to continue to harm Honduras. 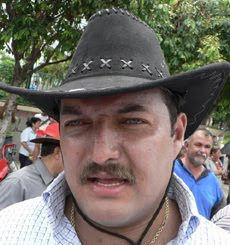 As a matter of fact, César Ham (photo), former presidential candidate of the UD (resistance) party told reporters Wednesday night that Zelaya's plans included travelling to Mexico and visiting other Latin American countries to help strengthen the resistance, and eventually returning to Honduras to push for a constitutional assembly. 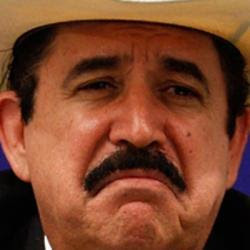 Leonel Fernández told Telesur that Zelaya wished to settle in Mexico and wished to become a member of the Central American Parliament. Telesur failed to note that members of the Central American Parliament (Parlacen) have automatic immunity for any and all crimes. Parlacen has the reputation of a useless, expensive, and corrupt ex-presidents club in which they can avoid prosecution for their misdeeds. 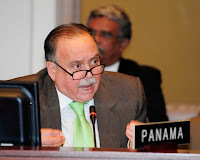 Costa Rica is not a member and Panamá recently withdrew from the organization for those reasons. With political asylum, Mel Zelaya would be subject to restrictions against political activities. Under this agreement, Zelaya is free to go to any country and to perform any acts. There is nothing to stop him from trying to develop influence against Lobo's government both within and outside of Honduras. Zelaya will be free to continue to promote insurrection and try to destabilize the country. We can also presume that he will have the financial support of Chávez to do this. 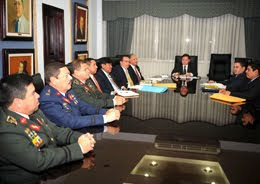 Some have already gone so far as to predict a future coup d'etat attempt by Zelaya against Lobo. A Venezuelan journalist reported Wednesday that Chávez has already met with Castro, Ortega, and FARC to plan the destabilization of Honduras using paramilitary forces. Lobo has probably gotten assurances from the US or others that Zelaya won't do those things or that they won't allow that to happen. We already know what assurances from Zelaya, the US, and OAS are worth: nothing! 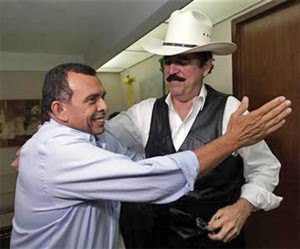 Just to prove my point that there will be no peace and reconciliation from Zelaya, Honduran newspapers quote Zelaya as saying, "For me it is a good gesture from Porfirio Lobo, I feel that he is making it to unmask the dictatorship of Roberto Micheletti." Does that sound like peace is in Honduras' future? Oh, and by the way, many international news articles include the first part of the quote but omit the second part − why? Like in many other instances over the past seven months, to not reveal what a crazy, vindictive person the US and OAS are supporting. Interestingly, while all the news reported that Zelaya is leaving for the DR, in typical Zelaya fashion, his spokesman reported that Zelaya "was considering the offer" to go the Dominican Republic if the conditions are right. No one can deny that Pepe Lobo must have credibility among the international community. But in the long run, much more important to Honduras will be his having credibility among the Honduran people. Ensuring that corruptos, regardless of their political affiliation or social status, are prosecuted will go a long way toward that goal. Oh, where do I start without writing a book? Zelaya Will Travel to Dominican Republic as "Distinguished Guest"
First of all: Dominican Republic? Why? 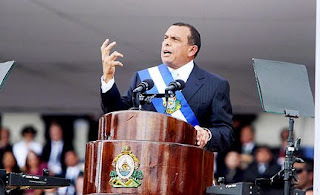 The Dominican Republic, or at least its president Leonel Fernández, has been one of the major and rudest critics of Honduras (next to Chávez and Arias), not to mention the DR's strong connection with Chávez. The DR doesn't have exactly a stellar reputation in the field of diplomacy, and in fact has a reputation for corruption, much like Honduras. Not only that, but Fernández has been working on his constitution to increase his powers as well. The DR does not recognize Honduras and up until yesterday, did not recognize our election or our president elect, Pepe Lobo! For those of you who keep up with these things, please make a note of the amount of foreign aid that the US and UN have given the Dominican Republic in the past couple of years and then please compare that with what they get this year or next year. I have no doubt you will see a huge increase. Maybe it will be funneled in some indirect way to try to cover it up and maybe there will be assistance from Chávez as well. But, there will be payment. Watch and see. The US once again is hiding behind yet another country or organization while they intervene to force their will on Honduras. It's as simple as that. President Obama and the US State Department are every bit as much or more interventionists in the internal sovereign matters of Honduras as any previous administration. He just tries to hide it while the State Department claims that they are only following the will the "international community". Bull. Sorry if this is a surprise to anyone, but it's true. 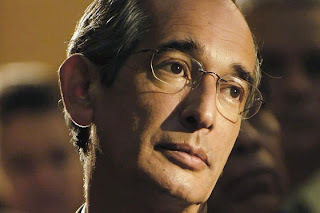 Does anyone really believe that Leo Fernández just felt so confident of his abilities and compelled to get personally involved in this disastrous situation after Nobel Peace Prize winner Oscar Arias failed, the OAS (representing the force of the entire hemisphere) failed, and the US (representing a huge chunk of Honduras' economy) failed? Come on! Get real. The US must really think that we are gullible to swallow that. c) admit that they made a mistake in calling this a coup to start with. c) use amnesty and exile to prevent the truth from coming out. Again I have to point out that Barack Obama's pledge to treat Latin American countries "as equal partners ....[and with] mutual respect" sounded good but was a false and empty promise. I've been continually shocked at the rude, insulting, and demeaning public comments issued by the US State Department as well as the blatant interference in internal matters of Honduras. What happened to the last Accord? Honduras already has an Accord. It's called the Tegucigalpa-San Jose Accord. On October 30, both sides, both Manuel Zelaya and Micheletti's government, agreed to the document after huge pressure (and many say threats) from the US and OAS. The announcement was greeted with much fanfare from Hillary Clinton, José Insulza, and Oscar Arias, who just couldn't congratulate each other enough for their excellent diplomacy skills. The original dialogues were forced upon Honduras by the US and OAS, who both specifically and publicly agreed to abide by the "Honduran solution." The US pushed for amnesty, but at Zelaya's insistence, provisions for amnesty were not included in the agreement. Pepe Lobo and all of the other presidential candidates also agreed to respect the Accord. By November 1, Zelaya declared it dead, a trick, a trap, a fraud, and refused to cooperate in any way. He had simply made a bad deal to accept the flip of a coin (a congressional vote, which was his own idea) and tried to renege on it when it came up tails. Interestingly, the US blamed that on Micheletti as well. The Accord also made some requests of the "international community", which were not respected by the international community. 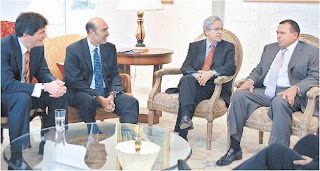 As a part of the Accord, a Verification Commission was named with two heavy-hitting OAS representatives, who both seemed to have no understanding of the document because they publicly stated or implied that their only goal was to force Roberto Micheletti to resign, something that was not agreed to or even addressed in the Accord. This clearly showed the OAS's extreme bias and willingness to ignore what the actual document said. The actual duties of the Verification Commission, as defined in the Accord, are to ensure compliance and resolve any disputes regarding the implementation of the Accord. Zelaya says the terms of the Accord were not followed, as he claims that the only purpose of the Accord was to restore him to office. José Insulza of the OAS and Ricardo Lagos of the Verification Commission have publicly stated that they agree with Zelaya. Anyone who has read the document knows that is false and you don't have to be an attorney to understand that. Micheletti says that Zelaya did not comply with the agreement. The US and OAS say that Micheletti did not comply with the agreement. So we have all these claims of non-compliance, but where is the Verification Commission? Why aren't they doing their job? Why are they not complying with the Accord? The truth is that they spent less than a day in Honduras on November 2 to give a press conference, quickly left the country before the first important deadline, and haven't been seen since. The OAS did not like the Honduras solution, so they ignore it. The US publicly gave lip-service to the Accord, but behind the scenes, continued to pressure and threaten to get Micheletti to resign and to provide amnesty for all. They even pressured Honduras' presidential candidates. Only one of them had the guts to complain about it publicly. I'm going to guess that Hilda Solís (the US representative to the Verification Commission) will never set foot in Honduras again. Her failure to fulfill her responsibilities would reflect on Obama and the State Department. The international media is not going to remind the short-memoried public that the OAS, US, and international community also had responsibilities under the agreement, so they can just pretend that it is all Micheletti's fault, which they do on a daily basis. Most notable among the few countries who have lived up to their promises are Panamá, Taiwan, and Colombia. José Insulza, Secretary-General of the OAS, personally promised that if Honduras went through the hellish weeks of dialogue and reached an agreement with Zelaya, that the OAS would respect the Honduran solution, would support the elections, would push for recognition of Honduras, etc., etc. He lied. Again, it is as simple as that. 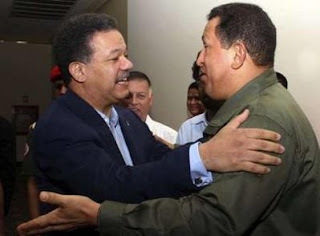 He is an unethical person, a lapdog of Chávez, whose word means nothing. He tried to trick Honduras but it didn't work. Behind the scenes entire teams from the OAS and US State Department were pressuring for the 'right' solution, not the Honduran solution. When Insulza's top man, John Biehl, began giving press conferences saying that a third-party president might be the solution (Micheletti's suggestion) and rebuking those (like Zelaya) who called for violence, he was quickly removed from Honduras and from the limelight of press conferences. To my knowledge, he has not been back even though he was the person with the most knowledgeable about the Accord. Zelaya asked for his removal because Biehl wasn't biased enough and Insulza complied. Here we are a week before the inauguration and the Obama Administration is still punishing Hondurans. They suspended the visas of five members of Micheletti's cabinet and Channel 11 news reported last night that the US has another 100 visa revocations in process. How incredibly petty and backstabbing and two-faced. They claim their reason is that because, somehow, these particular people have not complied with the Tegucigalpa Accord. Have they revoked any of the visas of the criminals who have been accused of stealing and misusing hundreds of millions of government funds? Have they revoked Zelaya's visa for refusing to comply with the Accord? My guess is no, but we'll never know since that is 'secret' information. Backfired: The Minister of Culture, Arts,and Sports, Mirna Castro, stated that if her visa was revoked for following the constitution, then she is proud. Many feel that way. One person said that he would frame the revocation notification letter from the US, hang it on the wall, and someday proudly tell his grandchildren about 'earning' that recognition by defending the constitution and sovereignty of the Republic of Honduras. It is people like this who make Hondurans proud. After agonizing months to achieve that agreement, now president-elect Pepe Lobo has decided unilaterally − to much shock and dismay among Honduran citizens and the voters who elected him − to change the terms. Okay, it looks like this is going to be a book, so I'll continue in the next article. I usually spend most of my computer time upstairs, just because that room gets a little better breeze and it is generally cooler up there. 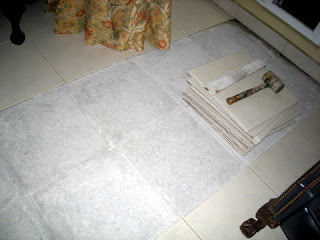 One night − I don't remember why − I happened to be at the breakfast room table downstairs and had the unexpected joy of watching my tile floor explode. I was on the computer reading news stories when I heard a faint pop-pop-pop. Initially I thought it was Chloe (the Rottweiler) scratching and bumping into something on the terraza and didn't pay much attention, but then the pop-pop-pop got louder. Much has been written about the Honduran political crisis, but there is another Honduran crisis that has been going on for a decade or more that affects many more people and is much more serious for the future of Honduras. That crisis is education. 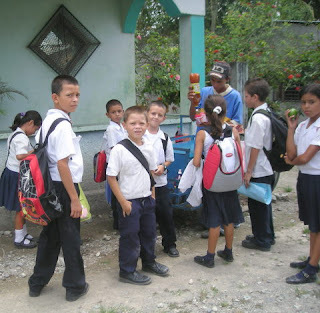 The quality of public school education in Honduras is horrendously poor (please see the UN, World Bank, and other reports linked here). One of the indexes used to measure the educational level of a population is the average amount of years of formal schooling. In Honduras, that index is 6.5, that is, the average Honduran has 6.5 years of formal schooling. It grows one school year every 10 years. In the early 1960s, this index was similar for Honduras as for Thailand, South Korea, Taiwan, Singapore and other nations known as the Asian Tigers for their rapid economic growth. Since, these countries have advanced the education of their people and their index is now above 12 years. If you make a graph of the average years of formal schooling and compare it to a graph of the people’s income in that country, you will find that both follow a similar pattern. The close relationship between education and economic development is unquestioned today. Public education is a form of wealth. In Honduras, many people still don’t see it that way. Yet many parents pay private schools that do nothing better than complete the public study plan, because usually the public schools don’t complete it. In developed nations, the quality of public schools has even been linked to the value of real estate: properties are worth more in districts where the quality of public schools is higher. The quality of public education is not only a matter for the parents who have their children in public schools, but a matter that should concern all Hondurans interested in living in a better country. In Honduras, we have a saying that “It’s not the same thing to see her coming, as talking to her.” When Zelaya boosted the minimum salary by 62%, teachers’ salaries, which are a multiple of the minimum salary, skyrocketed. But not only did their salaries jump, also the side benefits, like the contribution that the government makes to the teachers’ pension fund, also skyrocketed. So it didn’t come as a surprise that, when Zelaya’s government went to the bank, there weren’t enough funds to pay the new salaries. Before Zelaya’s ouster on June 28th, it had already been a conflictive year between the government and the teacher unions. Not only was the government behind on payment of their salaries, as usual, the government was also withholding both the government portion and the amounts deducted from teachers’ salaries as contribution to the Teachers’ pension fund, something which had never happened before. The Pension fund (IMPREMA) faced a lack of liquidity with which to pay the pensions of retired teachers. Teachers had been on and off strikes for months and naturally, the children’s education suffered. Suddenly, 5-6 days before the illegal referendum of June 28th, the government made a partial payment of teachers’ salaries and the major union leaders came on national TV announcing their support of Zelaya’s illegal Constituent Assembly. No one doubted they had been bought off. 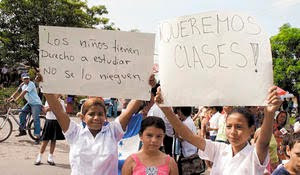 After June 28th, the teacher unions called another national strike, as always with suspension of classes, but this time for indefinite time, until Zelaya was reinstated as President, they said. And that was the straw that broke the camel’s back. Parents rose in anger, tired of teachers making their children the victims of politics. They demanded that politics not be mixed with education and that their children’s human right to a quality education be respected. 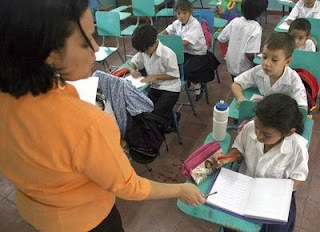 The Interim Government and the Human Rights Commission assigned inspectors to witness teacher’s absences and threatened to deduct missed school days from teachers’ salaries. In the end, most teachers, conscious of their rightful duty, returned to the classrooms and the government backed away from their threat. The rebellion of the parents was spontaneous. They were disorganized and lacked the resources to sustain greater actions. Recently, they have become a legal NGO and are struggling to implement coherent actions to protect and advance their children’s education under very tough circumstances. Once again, the teachers are rebelling against the start of the new academic year, refusing to follow the calendar established by the Ministry of Education. Currently, they have postponed the start of school activities from January 18th to February 1st under the pretext that they don’t recognize the Interim government (although they accept the government’s paychecks). But they threaten to not start classes even then, if the government is not fully up-to-date with their payments, which has never happened before because it’s a new year under new contracts. In other words, they’re making unreal demands. ASOPAFA is facing enormous challenges for the present and the future of education of Honduras. They must find a way to break the interference of politics in the national school system. For years, the administration of public schools has been left in the hands of inefficient government and union appointees, who use the public school system as a means to hire their political activists, with no clear-cut rules of accountability for their misdeeds and mismanagement of national resources. In many schools, they face serious social problems with drug-trafficking, prostitution and gang violence. They face serious health issues, such as the lack of drinking water, food and epidemics. Some schools are in such dire physical conditions that they pose a threat to safety of the attendants. There is a lack of materials, such as textbooks, desks, blackboards, and computers, even chalk, pencils and paper are in short supply and hard to acquire by poor parents. The parents need instruction on how to plan and manage a school budget and how to assist their children’s school in better ways. The Parents Association has 15,000 registered members of about 2.5 million possible, but their contact data is stashed in cardboard boxes. They receive calls from towns outside the capital with hundreds of parents who need help and want to join up, but don’t have the means to visit and assist them. They lack the organizational know-how and resources, yet they recently sponsored a televised forum of the presidential candidates speaking on their public education programs, with no other resources than a concentrated effort and a strong will to do everything in their power to better their children’s education. Personally, I have always believed that a good public education system is a key to achieve progress and development in a country, and that the key to advance the public education system is that parents become involved in their schools. We now have the opportunity to promote progress and development in Honduras by strengthening ASOPAFA. I encourage all of you to search for ways to support this group of concerned parents with your time, efforts, ideas and resources, whichever way you can, to advance their cause for a good quality education in the Honduran public school system. We are currently working to get their website up and running, and will continue to keep you posted on the progress they make. In the meantime, please contact me at jgallardo515 at yahoo.com .